Chef, restaurateur and author Kylie Kwong has just launched a range of delicious DIY kits and ready-to-heat meals, so we’re sharing a recipe by hers truly that can be created in under ten minutes! 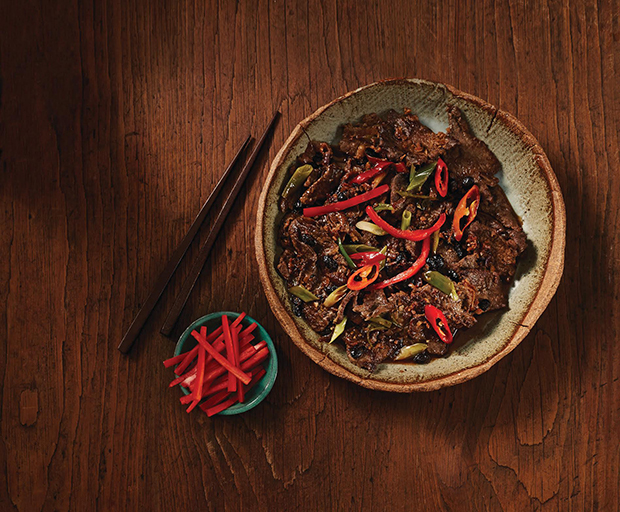 Using the Cooking with Kylie Kwong Black Bean Sauce, this stir-fried beef recipe is inspired by her own family traditions, bringing authentic Chinese cuisine to your table. Heat the oil in a hot wok until surface seems to shimmer slightly. Add the beef and onions and stir-fry for 2 minutes. Add the 190g tub of the Cooking with Kylie Kwong sauce and stir-fry for 2-3 minutes or until hot and all the beef is tender and coated. To finish, add chilli slices, toss to combine and serve. If you’re planning a barbecue lunch or dinner, this beef ribs recipe by Julian Wu will go down a treat. The meat is marinated in a fresh homemade chimichurri sauce, so bare in mind that you will need to do a little preparation the night before. We think mum’s worth the effort, though! Firstly, the night before you cook prepare the chimichurri. Combine ingredients and puree them in a blender or food processor. This should make approximately 2 cups of chimicurri. 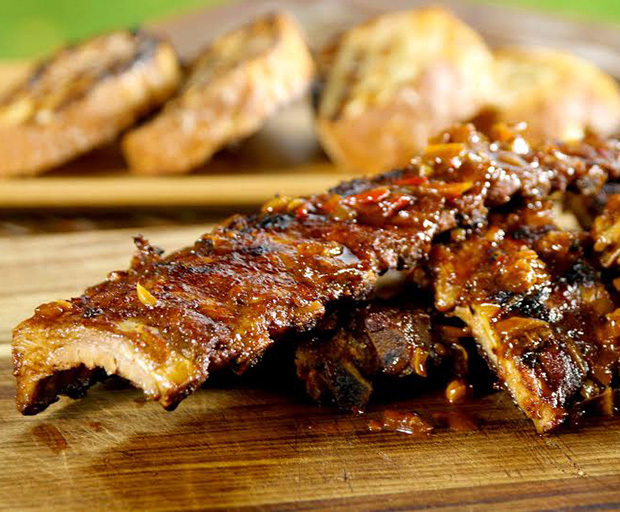 Set aside 1 cup to serve with the cooked ribs, and use the remaining cut to marinate the ribs. Make sure they are well covered and refrigerate overnight. When you are about to cook, take the ribs out of the refrigerator and season them with black pepper – let them reach room temperature while you prepare the coals for the barbecue. When the coals are ready, place the ribs on the hottest part of the grill and sear them on one side until they are nicely browned. Turn and baste the ribs with the brine and grill until the other side is browned too. Move the ribs to a cooler part of the grill and continue to turn and baste the ribs frequently until they are done. This should take between and 16-20 minutes. Serve the grilled ribs with the reserved chimichurri sauce, a green salad and a hearty red wine. With summer just around the corner, a light yet satisfying meal is the order of the day – especially at dinnertime. 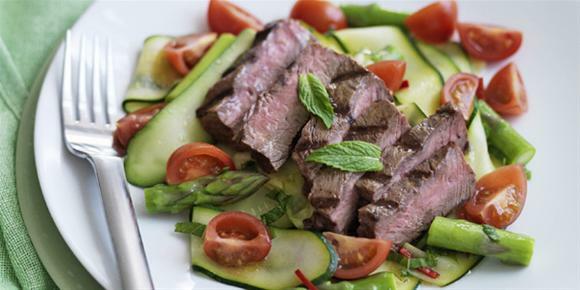 Try this warm beef salad to give you the iron your body needs as well as crucial vitamins and minerals to keep you powering into the warmer weather. Cut each beetroot into 4 wedges. Cook asparagus in saucepan of boiling water for 2-3 minutes, refresh under cold running water and drain. Add asparagus to beetroot and feta and combine. Preheat a chargrill pan over medium-high heat. Spray with oil. Season steaks with pepper and grill for 3 minutes, then turn and cook for a further 3 minutes until medium-rare (or done to your liking). Remove steak from the heat and transfer to chopping board. Cover with foil and stand for 5 minutes. 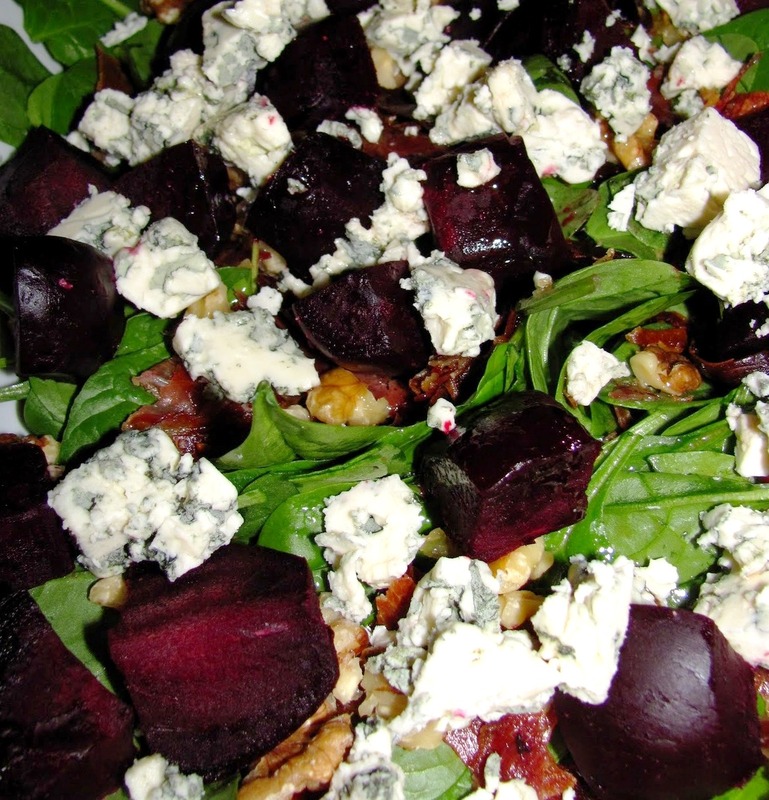 Meanwhile, add basil and rocket to the asparagus/beetroot/feta mix and divide between 4 plates. Thinly slice beef across the grain and place on top of the salad. 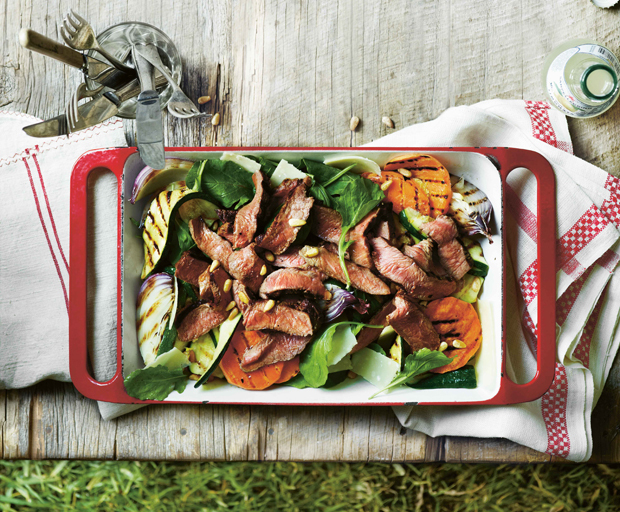 We’re always looking for new easy dinner ideas using beef, and this Cajun chargrilled beef rump steak, with grilled corn, sweet potato wedges and red cabbage slaw, is the perfect late summer meal to enjoy with friends. 1. Take the beef out of the fridge to allow it to come to room temperature. 2. Preheat the oven to 180oC. Toss the sweet potato wedges in 1 tbsp of the oil and spread on a lined baking tray. Cook for 40 minutes or until soft and coloured. 3. Rub the beef steaks with the cajun seasoning and cook on high on a barbecue or chargrill pan until cooked to your liking. Remove from the heat, cover loosely with foil and allow to rest for 10 minutes. 4. Brush the corn cobs with 1 tbsp of the oil and cook on a medium heat on a barbecue or chargrill pan for 10 minutes, turning regularly until evenly coloured. 5. Place the cabbage, chives, vinegar and the remaining oil in a large bowl and toss to combine. 6. 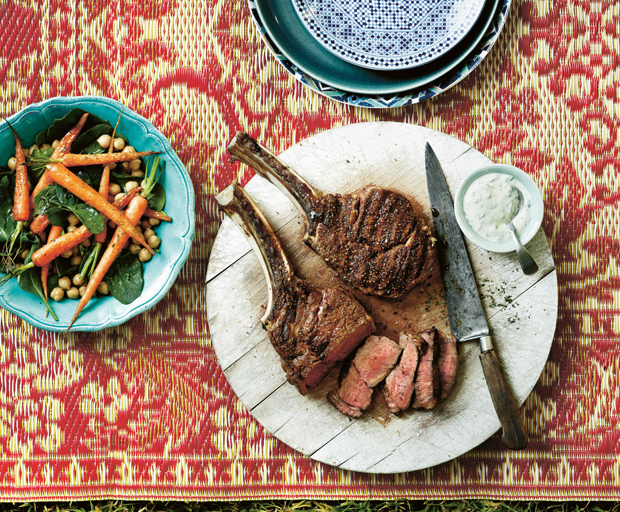 Serve the beef steaks with grilled corn, sweet potato wedges and cabbage slaw. * For a milder chilli hit, use less cajun seasoning or for no chilli, substitute with a steak seasoning blend. What better way to celebrate the warm weather than with a burger cook-off! Start with our best-ever gourmet burger recipe, add your favourite condiments and have friends build their own ultimate burger. For a really juicy burger, look for beef mince that’s not too lean, and always rest your meat after cooking (and don’t lose those resting juices, they’re great drizzled over a salad or mixed in with barbecue sauce for chips). 1. 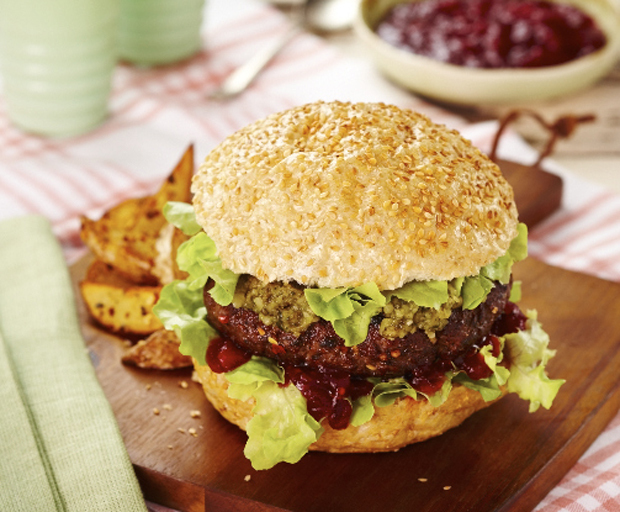 Combine mince with McCormick Grill Mates Blazin Pepper Steak seasoning and divide into 4 and shape into 10cm wide patties. 2. Heat BBQ or large frying pan over medium-high heat , spray with cooking oil and cook patties 3-4 minutes each side or until cooked through. Cook capsicums at same time on BBQ plate, until tender. 3. Toast hamburger buns, spread bottom halves with basil pesto, then top with meat patty, capsicum, rocket and dollop with beetroot dip. Top with remaining halves of each bun. Serve immediately. Bacon? Beetroot? Fried egg? How do you like your burgers? 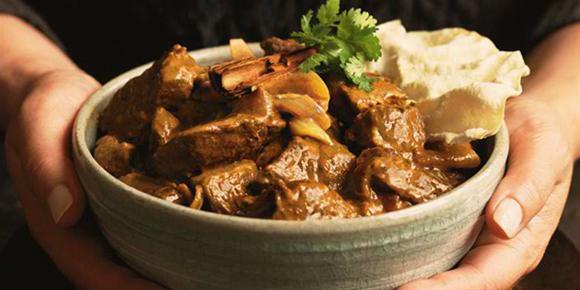 This slow-cooked beef stew from the 7000 Islands cookbook might just replace your go-to casserole recipe as your new favourite beef dish. 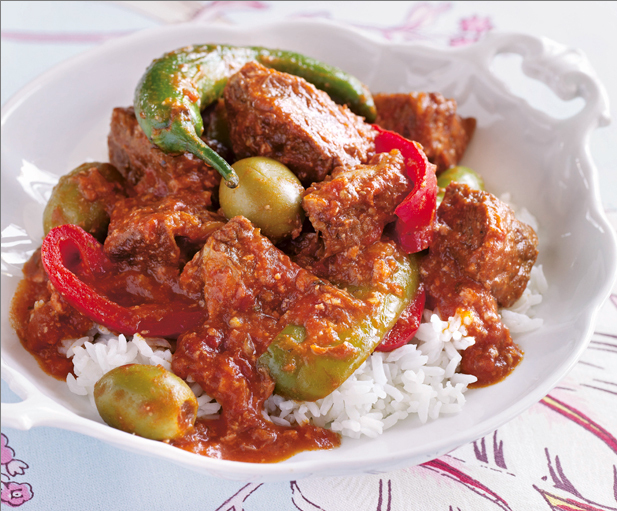 With Spanish influences of tomatoes and olives combined with Asian flavours of fish sauce and rice vinegar, the beef is cooked slowly so it’s fork tender, making it a great dish to serve family-style or for a party. Kaldereta is a mainstay on my mother’s party menu. As with all stews, it improves with time: slow cooking tenderises the tough meat and develops the rich sauce. Its flavours are further enhanced if served the next day. Look for liver spread in Asian grocery stores or liverwurst at supermarkets. 1. Heat 1 tablespoon of the vegetable oil in a large, deep saucepan over medium–high heat. Add half of the beef and cook for 4 minutes, turning until browned all over. Transfer to a plate and repeat with another 1 tablespoon of oil and the remaining beef. 2. Heat the remaining vegetable oil in the cleaned pan over medium heat and cook the garlic and onion for 5 minutes, stirring until soft. Add the tomato paste, stir for 1 minute, then add the tomatoes, vinegar, fish sauce, stock and bay leaf and season with freshly cracked black pepper. Return the beef to the pan and stir to combine (it should be just submerged in liquid; add a little extra stock or water if necessary). Bring to the boil, then reduce the heat to low and cook for 2 hours, stirring occasionally. Add the capsicum and cook for a further 30 minutes, or until they have softened and the beef is tender and breaks apart easily with a fork. Add the olives and chillies and cook for 2 minutes, or until warmed through. Add the liver spread and stir until well combined. Season with salt flakes and freshly cracked black pepper, to taste, and serve with steamed rice. With its Iberian flavours of tomato, onion and olive, kaldereta (also caldereta) is easily identified to have Spanish roots. Its name is also derived from the Spanish ‘caldero’, a type of cooking pot. Over time, Filipinos put their stamp on the dish by adding liver to thicken and enrich the sauce; now, tinned liver spread or grated edam cheese (queso de bola) are commonly substituted. Read our Q&A with 7000 Island cookbook author Yasmin Newman. This 30-minute meal is brilliant for summer when you want something fast and low-fat that’s also full of flavour. The bright mint oil makes the beef pop. 1. Steam the zucchini slices and asparagus in two batches, for about 5 minutes, until just tender. 2. Whisk together the olive oil, lemon juice, chilli and mint and pour over the vegetables while warm. Toss gently to coat and set aside. 3. Preheat a chargrill pan over high heat. Brush the steaks with oil and cook for 6 minutes on one side, turn over and cook for a further 5 minutes or until cooked to your liking. Cover with foil and rest for 5 minutes. 4. To serve, scatter the cherry tomatoes over the salad. Thinly slice the steak and arrange on top. Tips: Softened rice vermicelli noodles can also be added to this salad, toss them in with the zucchini. Sliced mini lamb roasts are also delicious served with this salad. What’s your favourite beef recipe? Pad Thai is one of Australia’s favourite takeaway dishes but it’s often high in fat and calories. Here’s how to give pad Thai a healthy makeover without losing any of the taste. 1. Soak the rice noodles in boiling water for 5-6 minutes until softened. 2. Meanwhile, heat 1 tablespoon of oil in a large wok or frying pan over high heat. Add the mushrooms and stir fry for about 3 minutes. Remove from the pan and set aside in a large bowl. 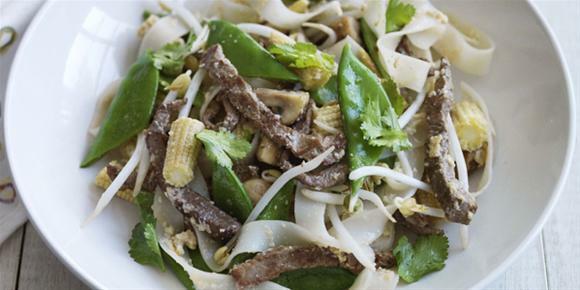 Heat 1 tablespoon of oil in the pan, add the corn and snow peas and 2 tablespoons of water and stir-fry for 3 minutes. Remove from pan and set aside in a bowl. Add 1 tablespoon of oil, garlic, beef and the cooked mushrooms and stir- fry for 2 minutes. Add the corn and snow peas. 3. Combine the eggs, fish sauce and lemon juice in a bowl. Add mixture to the pan and stir with a spatula until lightly scrambled. Add the noodles, beef and vegetables and beansprouts. Stir-fry briefly to mix everything together then serve garnished with coriander and lemon wedges on the side. Tip: Different vegetable combinations can be used. Small broccoli florets, thin slices of zucchini or asparagus pieces all work well in this dish. Which recipe do you want to see get a healthy makeover? 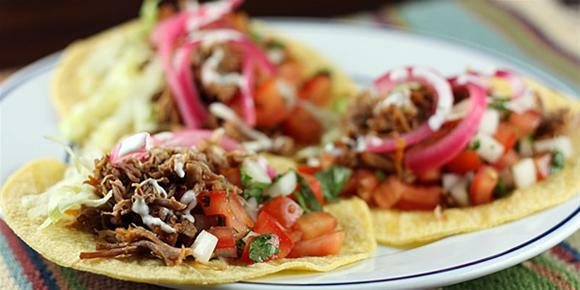 Ever had real Mexican tacos on holiday and wish you could recreate those flavours at home? This recipe is quick and easy – simply marinate the beef in the delicious marinade, grill and serve on corn tortillas with guacamole! 1. Combine marinade ingredients in small bowl. Place beef steaks and marinade in food-safe plastic bag; turn steaks to coat. Close bag securely and marinate in refrigerator 15 minutes to 2 hours. 2. Remove steaks from marinade; discard marinade. Cook steaks on the barbecue or under the grill, turning once. 3. Meanwhile combine avocado salsa ingredients in medium bowl. Set aside. 4. Place tortillas on a griddle or the barbecue. Grill until warm and slightly charred. Remove; keep warm. 5. Carve steaks into slices. Serve in tortillas with avocado salsa. Top with onion, coriander and lime wedges. What’s your favourite Mexican recipe? 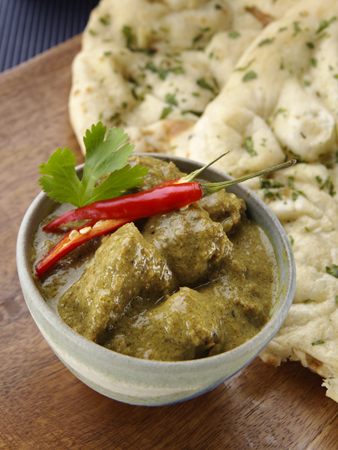 Why order a greasy takeaway when you can whip up a delicious beef korma quicker than delivery? This recipe can be made in the oven or the slow cooker so a tasty curry can be waiting for you when you get home. 1. Preheat oven to 180°C. Cut beef into 2.5cm-3cm cubes, season beef well, then add a little oil. Heat a large frypan over a medium-high heat. Brown the beef in 2 or 3 batches. Remove each batch and place in casserole dish. 2. Reduce heat in frypan, add a little oil, add onion and garlic, cook for 1–2 minutes. Add korma paste and stir for 1 minute. Gradually pour in stock, add coconut milk and sugar. Stir until mixture boils. Add to the beef in casserole dish, add cinnamon stick. 3. Cover the casserole dish, place in oven, and cook until the beef is very tender. Stir every 40 minutes or so, add water if needed to keep the ingredients just covered. Serve with coriander, rice and pappadums. Succulent, fall-apart lamb shanks can be done in the oven or slow cooker – we’ve provided both methods. Serve this classic winter warmer with mashed potatoes and green veg like beans and peas. 2. Heat a large frypan over a medium high heat, add a little oil. Brown the lamb shanks well on all sides. Remove and place them in a small roasting dish or large casserole dish. 4. Gradually pour in the combined wine and stock. Stir until the mixture boils. Pour over the lamb shanks. Cover the dish tightly with its lid or foil, place in oven. Cook for 1½-2 hours or lamb shanks are very tender. Turn the shanks occasionally and adjust the heat as it cooks if needed. You may need to add a little beef stock or water if it appears too dry. Serve shanks with a spoonful of the thickened sauce and mashed potato and green vegetables (beans and sugar snap peas). Brown the lamb shanks well and place in the slow cooker. Place the baby onions, rosemary and garlic in to the slow cooker with the lamb shanks. Add the wine and stock. You may need to add a little beef stock or water if it appears that the liquid does not cover the lamb and onions. Cover the slow cooker with its lid, cook on Low Setting for 8-10 hours or the High Setting for 4-5 hours. 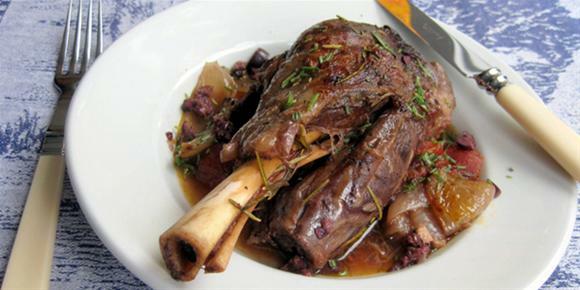 Cooktop method: Place the browned lamb shanks and other ingredients in a heavy-based pot. Partially cover, keep the heat low. Simmer until the meat is very tender. Stir occasionally; add water if needed during the cooking time to keep ingredients well covered. Simmer the lamb shanks gently and taste them to see if they’re ready. When it’s done the meat should be tender enough to fall from the bone with a fork. What’s your favourite slow cooker recipe? Inexpensive cuts like beef chuck simmered for hours in the slow cooker with a few other ingredients results in a luscious Italian ragu to serve over pasta or polenta – the ultimate winter warmer. 1. Cut beef into four or five large pieces. Season with salt and pepper, and drizzle with a little olive oil. Heat a large frypan over a medium-high heat. Brown the pieces of beef well on all sides. Remove and place in slow cooker bowl. 2. Reduce heat, add a little oil to the frypan and onion and garlic. Cook for 1–2 minutes, stirring occasionally. Add the flour and stir to scrape up residue from the base of the pan and ensure the onion is coated with the flour. Gradually pour in the stock and stir until the mixture boils. Pour over the beef in slow cooker dish. Add the tomatoes and thyme and a small pinch of sugar. 3. Cover the slow cooker with its lid, cook on low setting for 6-8 hours and then 1 hour on high setting (if you have time). Alternatively, cook on the high setting for 4-5 hours. To serve, shred the beef with two forks. Stir in the roasted capsicum and basil leaves. Serve over pasta and sprinkle with parmesan. * If you don’t have time to brown the meat or sauté the onion you can try this tip. Place the beef directly into the slow cooker, give the onions a minute in the microwave to soften and then into the slow cooker. Add a spoonful each of soy sauce and tomato paste with the stock to add depth of flavour and lift the colour. * Little or no stirring is needed when using the Low setting, stir the beef occasionally when using the high setting gives good flavour distribution. * Keep the lid on during cooking to maintain the temperature. * If you have time turn the slow cooker to high for the last hour to intensify the flavour and thicken the sauce a little. Prepare the pie filling by heating a large heavy pot on medium heat or induction setting 7. Add the clarified butter and bring to a sizzle before adding the onions and sautéing for a couple of minutes, stirring frequently. Add the brown sugar and balsamic vinegar and continue to fry for 3- 4 minutes to caramelise the onions lightly. Lay the beef on a large plate and dust with the flour. Ensure the beef is well coated in flour. Turn the heat up slightly, and drop the beef into the pot and brown and fry the meat on all sides. Drain the mushrooms from the water, retaining the mushrooms to add later. Now add the beef stock, 1½ cups of liquid from the mushrooms, the verjuice and marmite and season well with salt and pepper. Bring the contents of the pot to a simmer, place the lid on the pot and reduce the heat to low or induction setting 3 and allow the beef to slowly cook for 2 hours, or until tender and the sauce has thickened. Add the sliced mushrooms and cook through for a further 5 minutes. Make the pastry by adding the flour and butter to a food processor. Blend until the flour and butter resembles breadcrumbs. Add the sour cream gradually while the machine mixes, until a dough is formed. You may not need all the sour cream. This depends on how absorbent the flour is that you are using. Turn the dough out on to a lightly floured bench and form the dough into a rectangle shape. Cover with cling film and rest in the refrigerator for at least 20 minutes before using. Preheat the oven on bake at 200C. Lightly grease 12 small muffin or cupcake tins with butter. On to a lightly floured bench, roll out the pastry to a 5mm thickness and cut into 24 rounds that are larger than the muffin tin holes. Line the base of the muffin tins with pastry, pressing the pastry up the edges allowing some of the pastry to over hang from the tin holes. Taste the meat stew for flavour, adding additional seasoning if required. The stew should be thick and juicy with the liquid having reduced and the flavours concentrated. The meat should be tender and falling apart. Spoon the meat stew into the lined muffin tins to just above ¾ fill. Top the stew with a generous sprinkling of grated cheese and top with the remaining pastry rounds, ensuring lids are well sealed to the bases. Brush the pies with the egg yolk and bake for 25-30 minutes, until puffed and golden. Who are you supporting this weekend? 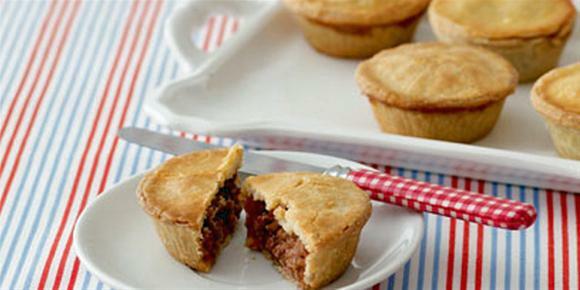 Dinner Explorer for more Footy Finals party recipes and entertaining ideas.